What’s it like to be a former youth in care at UBC? November 22 is Child Welfare Media Day. Journalists writing or producing for media outlets such as Discourse Media, the Tyee, Cited and The Courier are coordinating their efforts by publishing a story on the child welfare system — the objective is to increase coverage and deepen understanding of this system. This event is inspired by the San Francisco Homeless project, during which more than 80 media outlets published a story on homelessness on June 29, 2016. Tangible progress followed – “shelters were rushed into opening, [and] more than $130 million has been raised by philanthropists,” said Audrey Cooper, editor-in-chief at the San Francisco Chronicle. In light of Child Welfare Media Day, let’s talk about the UBC students who come from care — foster homes, group homes, or some form of government-funded independent living. According to a 2017 report by the BC Representative for Children and Youth (RCY), 6,950 children and youth are in care in the province, and 524 of those youth have aged out of care since 2016. 23 of those individuals attend UBC. The Ubyssey interviewed UBC students on what it’s like to go to UBC having been through care, and what resources the university provides in order to support them through their education. Out of respect for the individuals who chose to share their thoughts, we have shortened some of their names as per request. Paying tuition and fees at postsecondary is no small feat for many students, especially for those who enter UBC from the child welfare system. These individuals may have been on a youth agreement, special needs agreement, or another form of care from the Ministry of Family and Child Development (MCFD) or a Delegated Aboriginal Agency (DAA). The tuition waiver program is a resource for youth in and from the system to get their tuition covered, should they fit the eligibility requirements of their institution. “By putting me onto the [tuition waiver program], they made my continued education possible — it opened the door for me,” said Jeff, a fourth-year UBC student. Harri said that these eligibility requirements heavily influenced the timing of his education. “There seems to be some sort of bias where we think that youth within this certain time frame are more valuable — it’s a form of ageism,” said Harri. “Having to try to heal through trauma — that may take ten years, or twenty years, then when that time comes and we’re ready for school, it doesn’t make sense that it be taken away,” he added. The BC Representative for Children and Youth has advocated for similar adjustments in province-wide legislation. What if you don’t even know about it? Unless prospective students are actively searching for them, there’s no clear-cut mechanism to let them know about tuition waiver programs like the one at UBC. The implications of not knowing about this program are severe. Former youth who were on the youth agreement — for those under 19 — can be granted a maximum of $983.00 per month through the agreement with young adults, which they may be eligible for once they turn 19. This is intended to “cover living expenses” — housing, food, health needs, and so on. Anyone who lives in Vancouver knows well that $983.00 is a mere fraction of the living costs one faces per month. For instance, for permanent Canadian residents, a course load of 30 credits per month would typically cost $5,189.70. Good luck getting by with $983.00. “Thrown out into the water”: is there a community at UBC? “[Community] is very significant to my identity, but also to my health as well — emotional, physical, and mental health,” Harri said. He added that a strong sense of community provides him with a “sense of belonging,” especially when organizing for social change. UBC does hold non-mandatory meetings for students on the tuition waiver program, however, these are sparse — they generally happen twice during the school year. 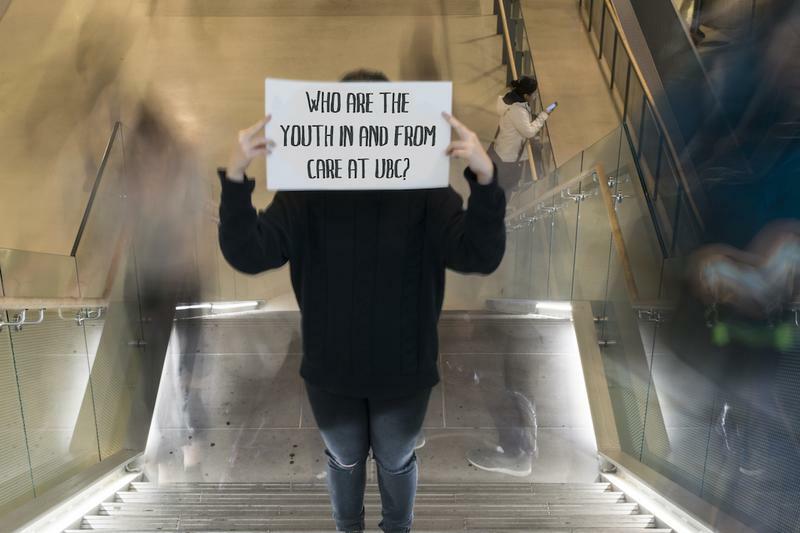 Although a sense of community may be lacking at UBC, many youth from care have sought it out themselves. Jeff is currently in the engineering co-op, Kyle held a position with the Youth Advisory Council, and Harri is involved in advocacy for youth from care and attended a recent rally in Victoria, which advocated for more support for young adults from care. How can we better report on the child welfare system? Child Welfare Media Day is about deepening our understanding of the system and enhancing our reporting on it. So, what does that look like to students? “Youth in care can speak for themselves in the media, [but] they’re not being given the opportunity,” said Harri. He added that while many articles rely on nonprofits for sources, there are youth in care who are advocating for change, and are willing, and “perhaps more capable” to speak about the child welfare system. This RCY report states that as of March 2017, 62.4 percent of youth in care were Aboriginal. Enhancing reporting on the child welfare system means going one step beyond these stats, and contextualizing them within Canada’s colonial history, and the impact the Sixties Scoop still has on families today. Better reporting also means acknowledging the resiliency and strength of youth from the system. “If you share that you’re on this program or a bit about your past, some people assume that you’re different for it, that you should be treated slightly differently maybe, with a little more care, but I don’t think that’s necessary,” said Jeff. Diana Oproescu is a third-year political science student at UBC and a fellow at Discourse Media. As a former youth in care she is a part of UBC’s tuition waiver program, and thinks that deepening our understanding of the child welfare system also means demystifying the myths of those who are in the system. If you are a UBC student who has been through government care, we would love to hear from you. Please e-mail d.oproescu@ubyssey.ca or news@ubyssey.ca to share your story.